"Thank you so much WOMEX for inviting us here once again. As a young girl, when you were just starting to write your first lines and everyone was making fun of you; or even your family, who are saying that a woman should not be singing calypso or a woman should not be speaking her mind. "A few years later, you went on to win the Calypso King award which was kinda odd because no woman had ever won the Calypso King award. So they had to change the name for you, to the Calypso Monarch. And I say you not only changed the name, you changed the game. "From that moment on, everything was different and it was much bigger than calypso, it was much bigger than music. It was about ourselves, about our Caribbean identity and the potential that each young girl and each young boy has in each of our countries. "When you wrote ‘No Madame’ to defend the plight of all domestic workers in Trinidad that were making a pittance, they were basically servants, you changed the laws of your country. You showed that a song can tranform, you showed everybody that laws can be written through song. "And I could go on and on and list all of the brave things you have done and the lives you have changed, but it’s pretty damn amazing how this young girl outsmarted almost everybody in the game to become the most celebrated calpysonian in the history of calypso. It’s pretty remarkable the sustained pressure that you have put on every single artist in the Caribbean, because I myself been working only for 20 years, I have never seen anybody with the stamina and the power and the determination that you have. Even at your age, when you walk into my studio you bring much more energy than any young kid, any aspiring, even famous artist has ever had. It’s amazing the joy that you have brought to my life and of the people around this fantastic project. "When everybody thought that calypso was dead, you go ahead and you produce a fricking gold album in France! People in the Caribbean was ‘What the hell is going on? We thought this thing was dead!’ And there’s this lady making waves at her young age of 76. I shouldn’t even say it, because she looks much younger and when she gets on stage you will see what I’m talking about. "I fell in love with you when you first hugged me, when you came for the first time to my studio, and you hugged me like if I was your son. Like if you had known me since I was a little baby. I fell in love with you when you grabbed my little baby girl and you kissed her like if she was your granddaughter. I can never forget that warmth and that love. Why? Because that is at the centre of everything that you have done and you accomplished. You have spread joy and love around the world that will live on forever. I will never forget those days in the studio with you with Drew Gonsalves and Al Ovando having the most fun we have ever had making music. "I’ll never forget how Manu Chao tried to explain to me how he felt when he met you in Trindad, and how he played your music in every single party that he went and every hotel lobby he was staying at and he would play your record and people were just smiling and jumping and asking him ‘what is this music?!’. This is very powerful and you have taught me a lot of things, and you will contune to teach us about ourselves, which is this love for life that we all have inside. "Almost 10 years ago, you landed at WOMEX in Seville to present Calypso@Dirty Jim’s, and your entire band did not show up! Caribbean Airlines cancelled the flight (thank you Caribbean Airlines), she’s in Saville, nobody with her, and her manager, her agent, the WOMEX people, they say ‘we’re really sorry, we cannot do the showcase, you do not have your band!’ and she said ‘Nah, nah, nah’. She right away instructed her agent or her manager ‘Get me a piano player, get me a bass player and we’ll get this show going!’. One hour before the show, she taught them everything they needed to know to play a calypso song and she pulled off the show. She mashed up the place! 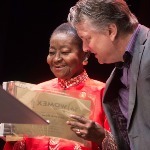 "Now for those who wonder why would this person get this award and all this attention now – there is so many calypsonians around the world, so many legendary calypsonians of course throughout the history, why? And I know why. It’s those little things, those little moments that define an artist, that they will never give up, that every adversity will make them stronger. They try to chop you down every fricking moment, and we all know that in the Caribbean, it’s like that in every single island or in my home country in Belize. They beat you down and down and down and that only makes you stronger and more determined. So this is about celebrating this fantastic cultural warrior. "This fight that you’re fighting, you’re fighting for all of us, not only for yourself. You’re fighting this for everyone who doesn’t have the courage to stand up like you did. I want my little daughter to be like you. I want my son to be like you. I want this passiont aht you have ingraved in every single boy and girl in the Caribbean. For them to stand up and do what is right and follow their dream and their passion like you did. 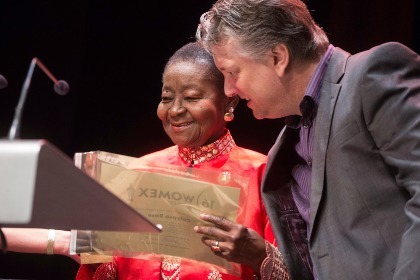 It is a great honour to present this award today to Dr McCartha Lewis, my dear Calypso Rose."